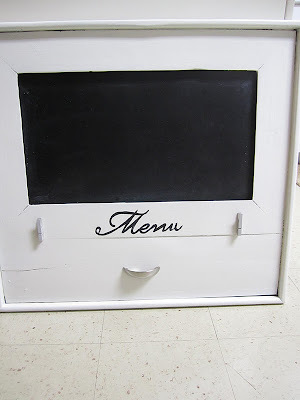 Swoon Style and Home: DIY Chalkboard Menu - what's cookin? Hi! It's Tuesday, which for me is the worst day of the week - next weekend is still far away and last weekend is way behind us. I always do my best to muddle through to hump day. I absolutely needed this. Because I work outside the home and because I am the one who picks up the kids from school and is in charge of our meals, I have to be organized with the meal planning in order to make healthy, homemade meals for my family. This means a coordinated grocery store trip/meal plan for the week. What I had been doing for years is to write out the menu for the week on a yellow post-it and put that on the fridge. It always bugged me, but I never did anything about it. Until now. The first thing I did was spray a fresh coat of chalkboard paint onto the chalkboard part. The chalkboard that came on the board was really rough and I knew it was going to be an issue to write on. I knew I was going to paint and prime over the frame so I didn't bother taping it off. Next, I puttied the holes where the mail bin used to be and sanded them nice and smooth. But I went back to my beloved white paint and decided to stay the course. It was time to prime. I used my favorite Zinsser primer and then did 2 coats of Dover White (who's surprised?). Looking good! There was a pretty big space under the chalkboard. I decided to put it to work. First, I added a cup pull that I had in my stash and turned it upside-down to act as a chalk holder. Cute! Then, I picked up some mini clothespins at Wal-Mart (8 for $1.50 or something) and glued them on the board with the glue gun. I figure these can hold recipes or clippings or even coupons. I painted them one of the grey paint samples from the den/kitchen - I think March Wind (Sherwin Williams). 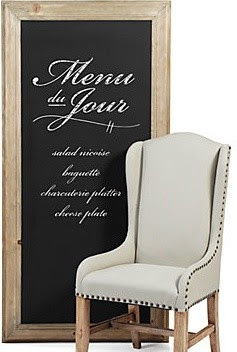 I did a screen shot of the Z Gallerie chalkboard and enlarged it so that I could use the "menu du jour" as a template. I free-handed it and took my time and it looks OK ... I wish it were a little more polished but maybe it's charming? 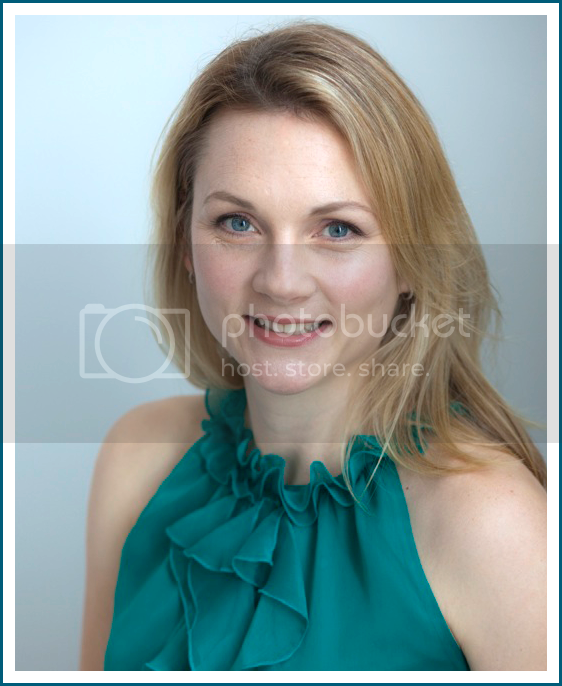 And here's the whole she-bang once again! What do you think? How do you keep tabs of what's cookin' each night? I'll share my meal planning tips in a future post. Now who's hungry? I love it! 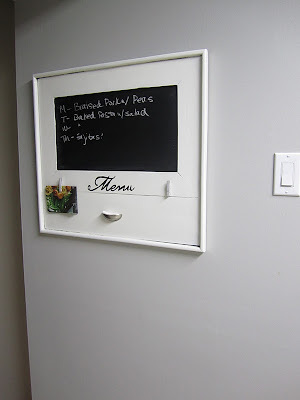 Where in your kitchen did you hang it? I would love your meal planning tips too. I go through phases where I'm really good about planning out meals, but I'd love to be more consistent with it. That is so cute!!! And what a great friend you have; I need to find someone like that to swap stuff with! :) I made a menu board several years ago just with an old cookie sheet, but now my kitchen is so small I have no where to put it. So for now i just plan out my meals in my phone's calendar. It's nice because at 5 my phone beeps at me to start dinner. But I miss being able to actually see the meals all planned out on the wall. 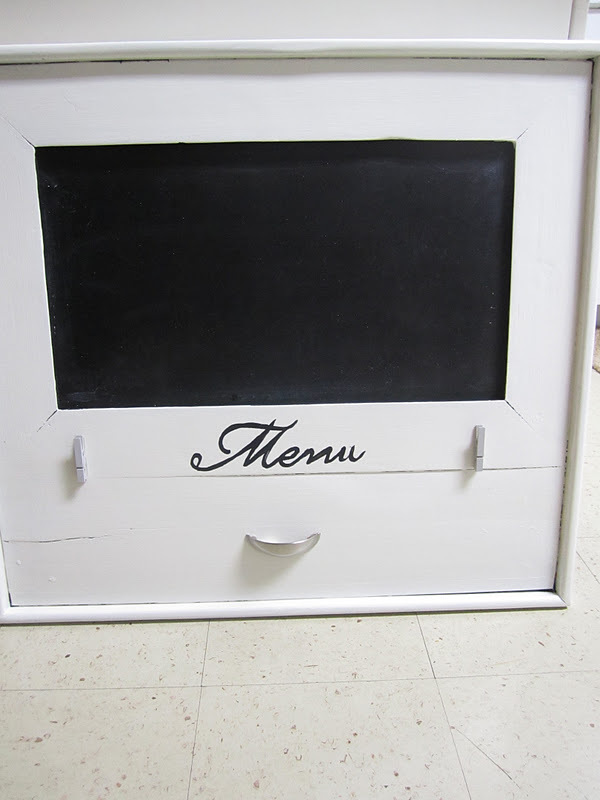 Plus menu boards are just so cute. Can't wait to have a bigger kitchen again and then I'd like to make another one. I adore that!!! Only $1.50?? Oh my goodness! I would've been tempted to leave it unpainted too--what a cool look that was, but I like your finished version a lot better. How are you so good at painting letters/words? I'm horrible at it hahaha. Looks amazing! I keep track of mine on my computer now since I'm doing that series on recipes from other blogs :). Adorable! I love using the handle as a cup! Brilliant! Thanks guys! I'm happy with it and it is really useful in the kitchen. I'll definitely share some meal planning tips in a future post. Happy Hump Day!